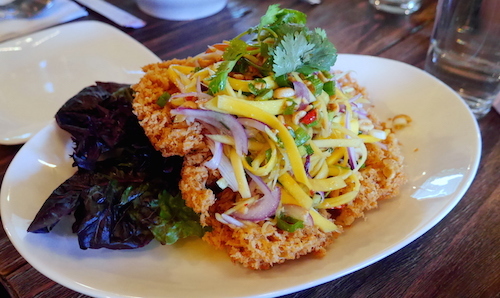 Despite the fact that the Southeast Asian communities in New York City still are quite small, Elmhurst continues to be the forefront of most of what good Thai cuisine we are afforded here. 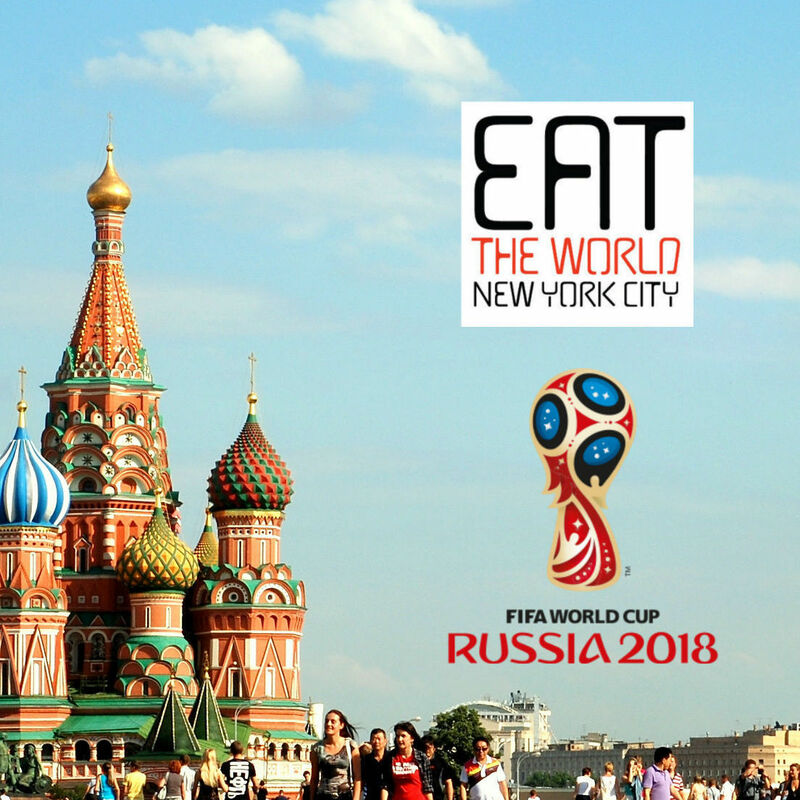 Red Hook, Brooklyn now has a champion, and Hells Kitchen still has a small list of adequates, but it is here where one can expect that any of the ten or so restaurants will be good examples of what the country can cook. Paet Rio is in its first year of business and is an easy inclusion on this list, the name a nickname for the chef's hometown of Chachoengsao, just east of Bangkok and probably one day swallowed up by its suburbs. Unfortunately the dish called paet rio, (literally "eight slices," the method in which a fish is served in a local dish), is not on the menu. When I inquired about specials the place had, I was directed to all points out from center, somewhat disappointing when a place name shows up so significantly. Thankfully all the food was cooked terrifically, and the early disappointment quickly turned to smiling faces at our table. On the menu, most of what seems interesting here shows up on the largest section, described simply as "House's Special." The chef directed us towards the dishes that seemed to be garnering the most attention in media, possibly a safe play in her mind for a table of non-Thais. 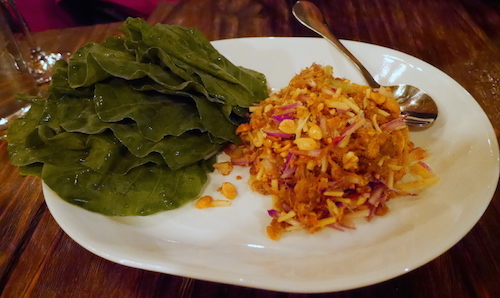 Before our entrees arrived, her first recommendation was one we took and really enjoyed, the miang kha-na ($10.98, above). Dried pork and peanuts make the bulk of the size here, but a healthy dose of chilis and lime wedge with rind on mix with shredded ginger and onion to create the multi-layered tastes you heap into a leaf of Chinese broccoli and place into your mouth. 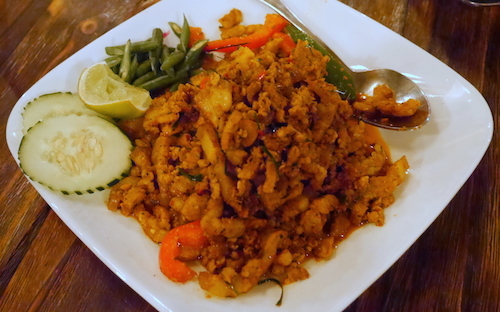 After this gets your mouth watering, the sai krok isan ($7.98, below) seems very tame in comparison. 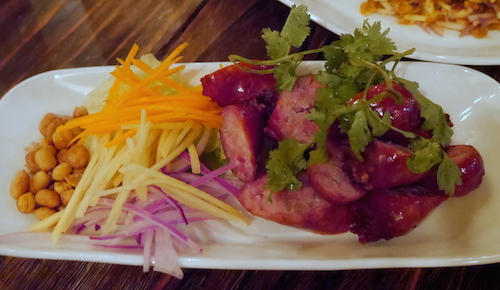 This veteran dish of Isan and Lao cooking is always splendid, and the small wedges of sausage did not disappoint here, needing absolutely nothing for dipping or addition. 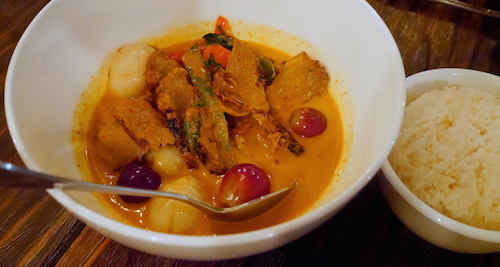 I was excited to cover the table with curries, and started with kaeng phet pet yang ($14.98, below), a red duck curry that usually features pineapple but here had lychee and grapes along with the basil and bamboo. This was definitely a first for lychee to appear in a curry I have eaten, and I would not hesitate to recommend this, as it seems like the perfect sweet fruit to hold in as much savory spicy curry as possible, giving a bite that literally bursts with all the dish has to offer. 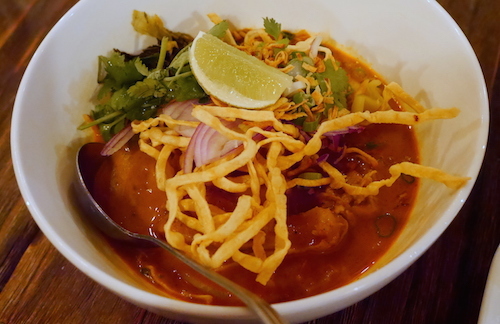 Having recently been wowed by the dish at a new Brooklyn restaurant using it as a namesake, it seems khao soi ($10.98, below) is now making a surge in New York. Bowls I had here years ago always left me severely disappointed after enjoying the magnificent bowls you find in the north of the country. We were all very satisfied with our curry here though, finishing off the soft slippery noodles underneath, as well as the disappearing drumstick that no one claimed to have eaten. If I had one dish I was not terribly fond of at the meal it was khua kling ($11.98, below), which did come heavily recommended. Typical of more southerly cooking, this is a dish of dried meat, here using pork belly which was far too soggy for my liking. I have had very good pork and beef renditions in southern Thailand and always found them to be a very sweaty and wonderful street eating experience, and while this did pack a nice punch, it just lacked the creativity of the other dishes on offer here. My only real regret this night though was only having two dinner companions with me, we needed a larger assortment. 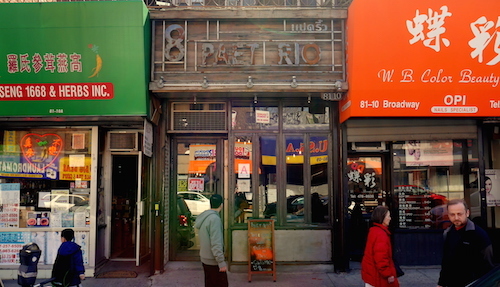 8 Paet Rio is the type of place that is not afraid to serve non-Thais with memorable fiery meals, and that is just one more notch in the belt of the burgeoning, but still tiny, Thai scene here.